Moscow, February 1953. A week before Stalin's death, his final pogrom, "one that would forever rid the Motherland of the vermin," is in full swing. Three government goons arrive in the middle of the night to arrest Solomon Shimonovich Levinson, an actor from the defunct State Jewish Theater. But Levinson, though an old man, is a veteran of past wars, and his shocking response to the intruders sets in motion a series of events both zany and deadly as he proceeds to assemble a ragtag group to help him enact a mad-brilliant plot: the assassination of a tyrant. While the setting is Soviet Russia, the backdrop is Shakespeare: A mad king has a diabolical plan to exterminate and deport his country's remaining Jews. Levinson's cast of unlikely heroes includes Aleksandr Kogan, a machine-gunner in Levinson's Red Army band who has since become one of Moscow's premier surgeons; Friederich Lewis, an African American who came to the USSR to build smelters and stayed to work as an engineer, learning Russian, Esperanto, and Yiddish; and Kima Petrova, an enigmatic young woman with a score to settle. And wandering through the narrative, like a crazy Soviet Ragtime, are such historical figures as Paul Robeson, Solomon Mikhoels, and Marc Chagall. As hilarious as it is moving, as intellectual as it is violent, Paul Goldberg's THE YID is a tragicomic masterpiece of historical fiction. 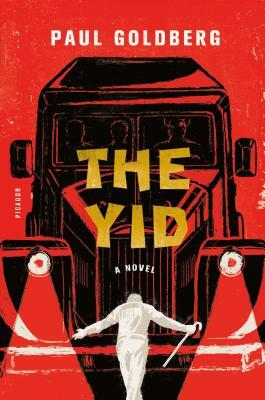 Paul Goldberg’s debut novel The Yid was published in 2016 to widespread acclaim and named a finalist for both the Sami Rohr Prize for Jewish Literature and the National Jewish Book Award’s Goldberg Prize for Debut Fiction. As a reporter, Goldberg has written two books about the Soviet human rights movement, and has co-authored (with Otis Brawley) the book How We Do Harm, an expose of the U.S. healthcare system. He is the editor and publisher of The Cancer Letter, a publication focused on the business and politics of cancer. He lives in Washington, D.C.